Browse Jallo's quality replacement parts. The Orion™ KRX Series vacuum pumps are the work force of the industry, in all types of equipment, such as Robotics, pick and place machines, vacuum chucking, graphic arts, printing, material handling, air sampling, suction lifting, packaging, vacuum sealing, blow molding, too many to list. 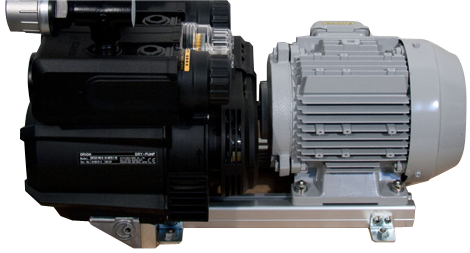 The Orion KRS and KRX series vacuum pumps are no longer in production. But, have no fear, Jallo carries complete units in stock, direct replacements, as well as many parts no longer produced. We also carry rebuild kits to completely overhaul your Orion™ KRX-1, KRX-3, KRX-5, KRX-6, KRX-7, KRS-1, KRS-3, KRS-5, KRS-6, KRS-7D, and KRS-7A at your facility, or feel free to call us or send your pump to us, and we will give you a free estimate on the repairs needed. The Orion CBX series vacuum pumps are dual driven Orion KRX series vacuum and pressure pumps, specialized in the printing and converting arena, where separate controls for vacuum and pressure are needed from the same source. The Orion™ CBX Series are also used where large amounts of both vacuum and/or pressure is needed. The Orion CBX and CBX series are no longer in production. But have no fear, Jallo carries complete units in stock, direct replacements, as well as many parts no longer produced. We also carry rebuild kits to completely overhaul your Orion CBS-15, CBS-25, CBS-40, CBS-62, CBX-15, CBX-25, CBX-40 and CBX-62 at your facility, or feel free to call us or send your pump to us, and we will give you a free estimate on the repairs needed. The Orion KH series of vacuum pumps are specialized in industries where a clean dry vane technology is needed, as well as high vacuum levels. These pumps are capable of producing vacuum levels up to 29.99 inches of mercury, or 97.5 kPa. These pumps are used in the high tech industries, where clean dry running pumps are necessary, as well as the high level of vacuum produced, such as robotic pick and place machines and the such. The Orion KH series of vacuum pumps range in size from the Orion KH200/KHA200 at 0.25HP to the Orion KH410/KHA400 and the Orion KH750/KHA750, with CFM levels from 5 to 10 CFM. The Orion KH410 and KH750 are no longer produced, but call Jallo for parts which are still available for these units. 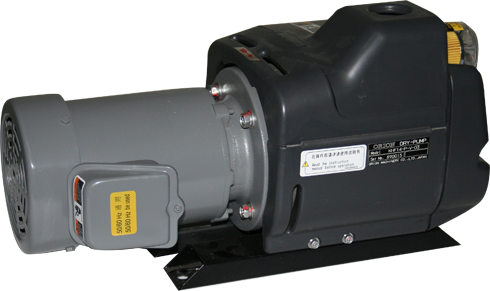 The Orion KRA series of vacuum pumps are used in every part of a variety of industrial vacuum situations. They are used where large amounts of vacuum and/or pressure are needed to run robotics, vacuum conveyors, laminators, printing presses, feeders, vacuum chuck, and vacuum lifting. These pumps are capable of producing vacuum levels up to 25 inches of mercury. The Orion KRA-8 and KRA-10 are no longer being produced. 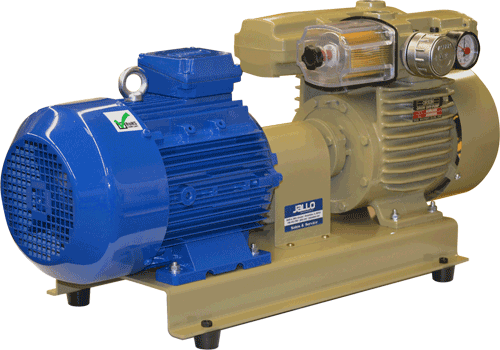 But have no fear, Jallo offers complete replacements, replacement parts, replacement pumps, and in-house service of your Orion KRA-8 and KRA-10 vacuum pumps. The Orion KRA DP series of vacuum pumps are used in the industrial arena where large amounts of flow is needed to run your industrial equipment. These pumps can produce independent vacuum and pressure levels from a single source. They are used where large amounts of vacuum and/or pressure are needed to run robotics, vacuum conveyors, laminators, printing presses, feeders, etc. These pumps are capable of producing vacuum levels of up to 25 inches of mercury. The Orion KRADP Series of pumps can produce well over 150 CFM of vacuum and pressure. The Orion KRF series vacuum pumps are the work horse of the industry, in all types of equipment, such as robotics, pick and place machines, vacuum chucking, graphic art, printing, material handling, air sampling, suction lifting, packaging, vacuum sealing, and blow molding. 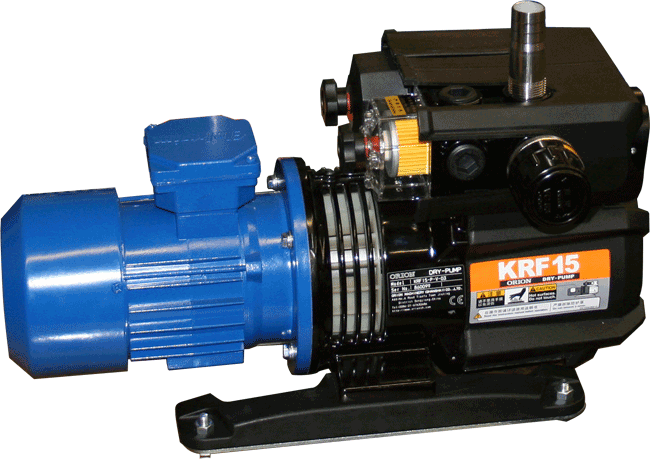 The Orion KRF series is the direct replacement for the Orion KRS and KRX series of vacuum pumps. Jallo carries complete units in stock, direct replacements, as well as many parts in stock. 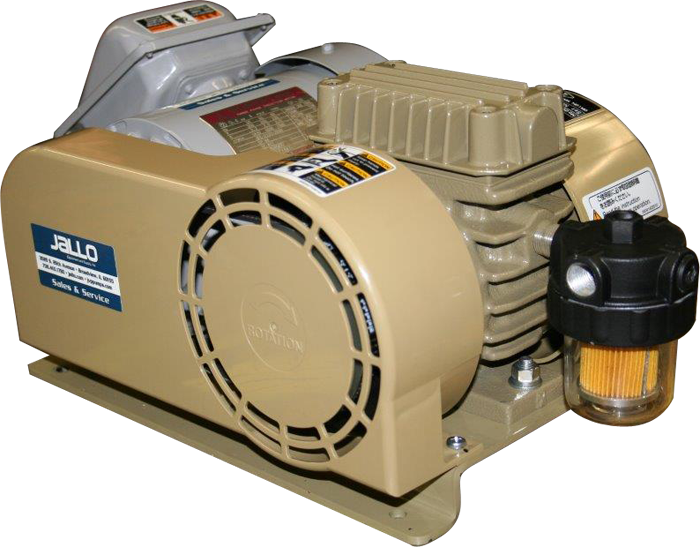 We also carry rebuild kits to completely overhaul your Orion KRF-15, KRF-25, and KRF-40 vacuum pumps, or if you prefer, ship your KRF pump to us and we will give you a free estimate on the repairs needed to rebuild your pump. The Orion™ KRF series of vacuum pumps are the updated versions of the Orion™ KRX series of vacuum pumps. 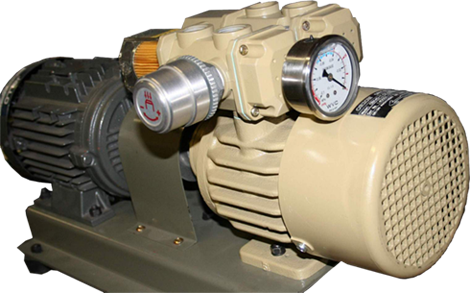 The Orion CBF series of vacuum pumps are the work force of the industry, they are dual KRF series pumps in a single unit. They can be used where independent levels of vacuum and pressure are needed to control your processes, as well as where large quantities of vacuum and/or pressure are needed. They are used in the material handling, air sampling, suction lifting, packaging, vacuum sealing, and blow molding industries. 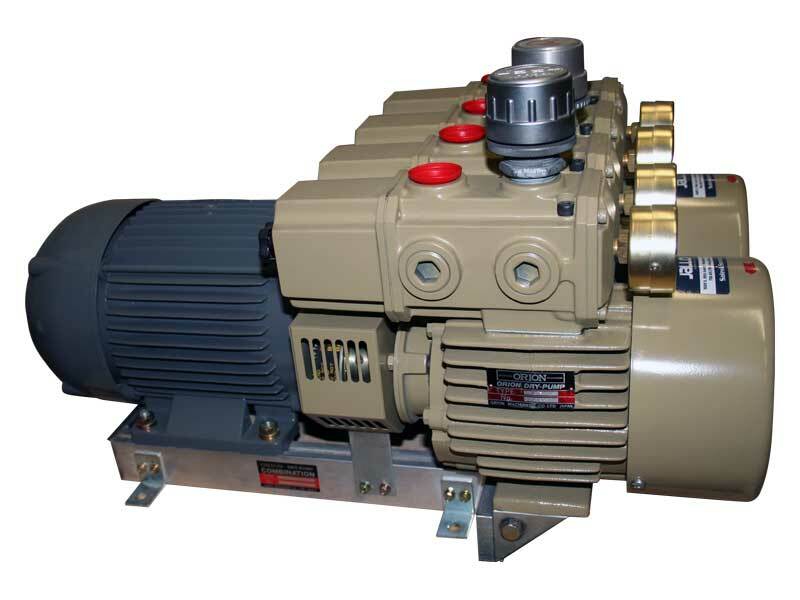 The CBF series is the replacement for the Orion CBX/CBS series vacuum pumps. Jallo carries complete units, direct replacements, and many parts in stock. We also carry rebuild kits to completely overhaul your Orion CBF-15, CBF-25, and CBF-40 vacuum pumps, or if you prefer, ship your CBF pump to us, and we will give you a free estimate on the repairs needed. The Orion KHF Series of vacuum pumps are specialized in industries where a clean dry vane technology is needed, as well as high vacuum levels. 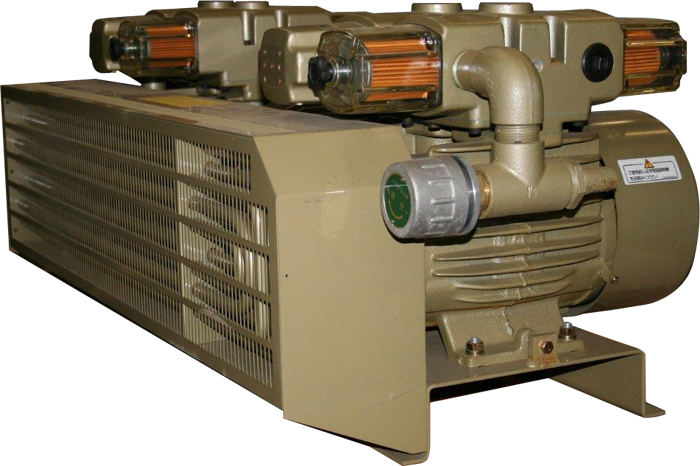 These pumps are capable of producing vacuum levels of up to 29.99 inches of mercury, or 97.5 KPA. These pumps are used in the high tech industries, where clean dry running pumps are necessary, as well as the high level of vacuum produced, such as robotic pick and place machines. Copyright 2017 | Jallo Equipment & Supplies Inc.